Whew! We're more than half way through October and for me this week I have parent conferences. PDAS observations begin in another week and I'm feeling a little overwhelmed. 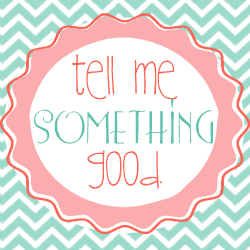 So it's time for another Tell Me Something Good linky party so we can focus on the positive things that are happening! Just tell me at least one good thing that's happening at school and at least one good thing that's happening in your home life. Something Good at Home: I have more than half of my Christmas shopping done, thanks to a slight addiction to 31 bags! I love those bags and they are so well made. My mother, grandmother, sister, and sister in law will all be getting a cute bag-monogrammed of course! I would love to hear about the great things going on in your life! If you don't have a blog leave a comment telling me your Something Goods! I get so much GOOD energy when I stop by your blog . . . thanks for the Christmas shopping update; I am SO impressed!! You go girl. Congrats on your shopping! I have been thinking about starting. Sometimes it is so easy to focus on the negative. Earlier in the year I was feeling very frustrated with my class. Then I decided to make an anchor chart..."Great Things About My Class". It really helped me with my bad attitude. This is a good party. I think I'll link up this week! Early Christmas shopping is a little fetish of my own, too. I will be linking up this afternoon! What a great idea! I love the focus on the positive. Your blog is great! I just started following you. Oh my, I am so impressed with your shopping that I don't even want you to know what I typically end up doing. Maybe once I get through this weekend I will have it together enough to get started! Your linky idea is such a good one. I think that this time of year we are easily sucked into negativity. We're tired, busy, and overwhelmed, so our reserves are L.O.W. Throw in shorter days and longer nights and we are easy targets for being less than shiny. You made me smile and think about the good stuff :) Linking up right now. Trick or Treat-- a Giveaway!